Sambodromo: 5 Reasons Why It's A Must See! 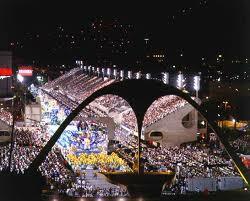 The Sambodromo is the stadium of samba. It's essentially a giant runway with structures much like a stadium built around it running down each side of the avenue. It was built by a world famous architect from Brazil, Oscar Niemeyer, and his skill shines throughout the avenue like no other place on earth. The avenue was erected in 1984 specifically for the Samba parade, where all the Rio Samba schools dance and entertain audiences and a handful of judges which vote on which school did the best in the parade. It is a huge spectacle and one of the biggest draws for tourism to Rio, with its combination of music, entertainment, and mythology; it really shows off the rich culture of Brazil. Here are the 5 reasons why it's a must see. The Music - The music plays a huge part in the Samba parade. It is built to be a perfectly suited venue for the large audience, and that allows you get closer than ever to the parade, and indulge in the unique sounds of Brazilian music. Classical pieces and modern music collide in a splash of culture at the Sambodromo. The Spectacles - The element of competition between the schools and the legacy of the Samba parade pushes the need for innovation and the creation of grand spectacles. Ultimately, driving them to try and outdo one another and keep the reputation of the parade up leads to giant models of Gods and mythological beings, bright colors and extravagant light shows, extravagant outfits and much more. The omnipresent bird in the Rio religion was recreated just last year as a shinning giant model. The miniatures and large landscape of Grande Rio has now become a traditional spectacle as well in the parade. The Architecture - It is no small secret that this amazing structure is one of the most unique architectural feats. A stadium built around an avenue that shows off the creativity and skill of Oscar Niemeyer, is in itself worth it to visit. The Competition - The thrill of the competition between the Samba schools is now itself a tradition. Many of these schools have their own trademark icons, and have been competing for decades. It is much like a sport in the way they must compete, except instead of winning a game, they simply seek to entertain the most, promising extravagant shows well worth the trip. The Culture - While the culture of Rio is observed through the people, the music, dancing and style. The icons of the show are often religious icons and traditional symbols that are tied deep into the history and culture of Rio, such as King Momo or the Beija Flor. Not only will it entertain, but it will educate as well. There are many reasons to visit Rio, and the Sambodromo has earned its way to the top of that list. It is renowned as the greatest street parade and will not disappoint.